Your body maintains a relatively small amount of blood sugar in your circulation on a fasting basis (about one teaspoon per five quarts of blood). Following a meal your blood sugar levels naturally rise, as sugar, which is fuel for energy, is distributed around your body. This activity requires proper function of the hormones insulin and leptin. Once the refueling operation is complete, then blood sugar levels, insulin levels, and leptin levels return to a pre-meal baseline. In order to maintain normal blood sugar levels between meals and during the night, your pancreas makes a different hormone called glucagon that assists your liver to make and metabolize blood sugar, while simultaneously burning fat. It is vital to maintain the healthy function of this blood sugar metabolism system in good working order a cornerstone of health. The foundation of this system requires a good diet and consistent exercise. Additionally, as desired, nutrients can be used to assist the healthy metabolism of blood sugar, and the operation of insulin and leptin. 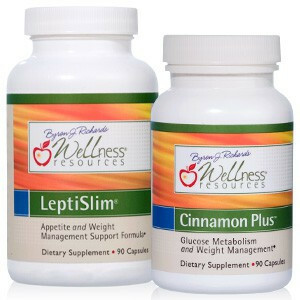 I have designed three superior dietary supplements to assist your normal and healthy blood sugar metabolism: Cinnamon Plus™, LeptiSlim®, and Leptinal®. A brief description of these products is listed next, followed by more in depth information about how they work. I then explain a number of other blood sugar-related topics and how nutrition can help. If you would like to better understand how blood sugar, insulin, and leptin work in your metabolism, please consult my feature-length news article: Insulin, Leptin, and Blood Sugar.